Posted on August 24, 2015 by Courtney Duerig / This entry was posted in Container Gardens, Pottery and tagged ceramic pots, clay pots, container gardening, garden containers, garden pottery, landscape pottery. Bookmark the permalink. Edible Gardens are becoming increasing popular due to the economy and growing awareness of where our food comes from and the harmful effects of pesticides and other chemicals. Now that so many people interested in growing food for themselves, they are turning to the internet and garden centers to learn how to do it. This is an opportunity for providers of garden supplies and accessories to teach a new generation of gardeners that they don’t have to have boring rows of high yielding crops. They don’t have to turn their front yards into mini farms, they can still have a beautiful landscape that is functional. 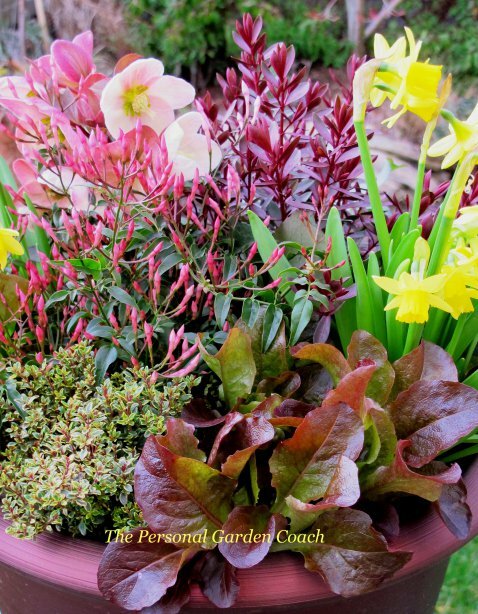 Edible garden containers can add so much beauty to an edible garden, with colorful and edible arrangements. Below are some edible containers we think are brilliant! 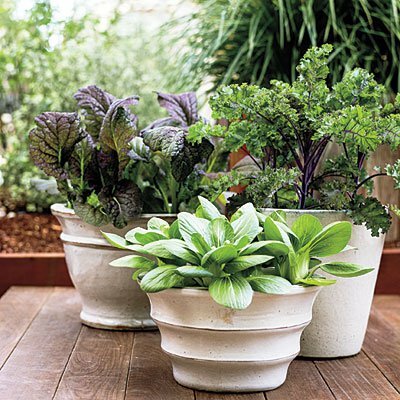 These modern containers with varieties of lettuce and greens in modern containers are the epitome of simplistic functional beauty. 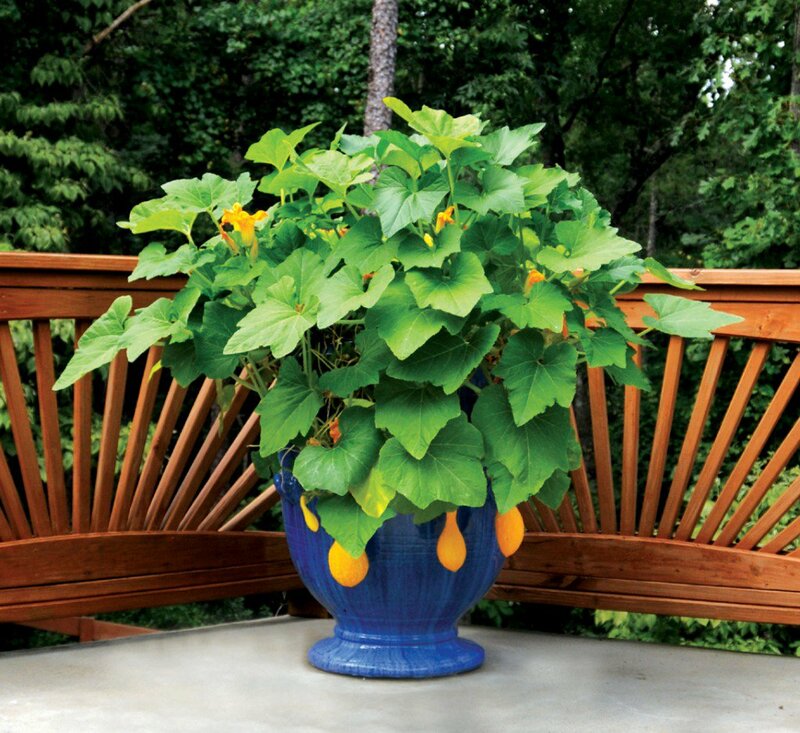 The award winning landscape designer, Pamela Crawford has a knack for color and had paired bright yellow squash with a luminous sapphire colored urn. Container designer Christina Salwitz reviews the book The Edible Front Yard by Ivette Soler on her blog The Personal Garden Coach. This beautiful, vibrant creation is fully edible, although its almost too pretty to eat! It contains Red sails lettuce, lemon thyme, hellebore and jasmine. 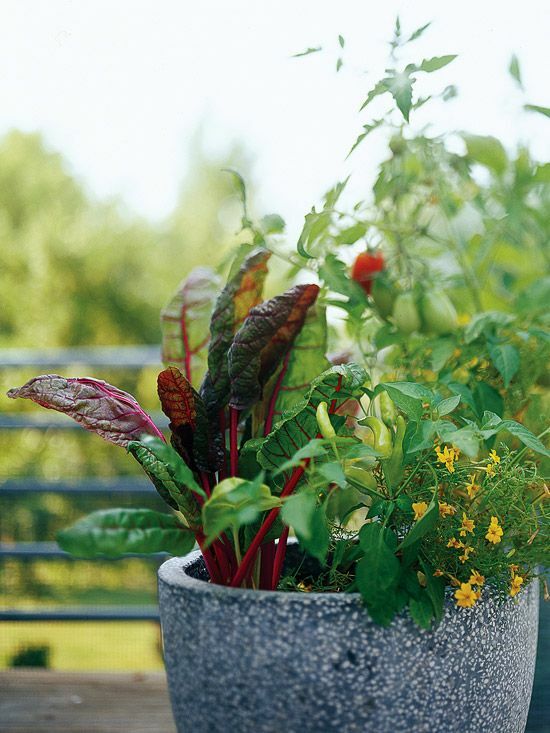 In this cool colored speckled stone planter, pops of color, red-stemmed Swiss chard, Lemon Gem marigolds, and a hot pepper make a fantastic statement. Don’t be afraid to let it all overflow to create a lush garden with a high yield. 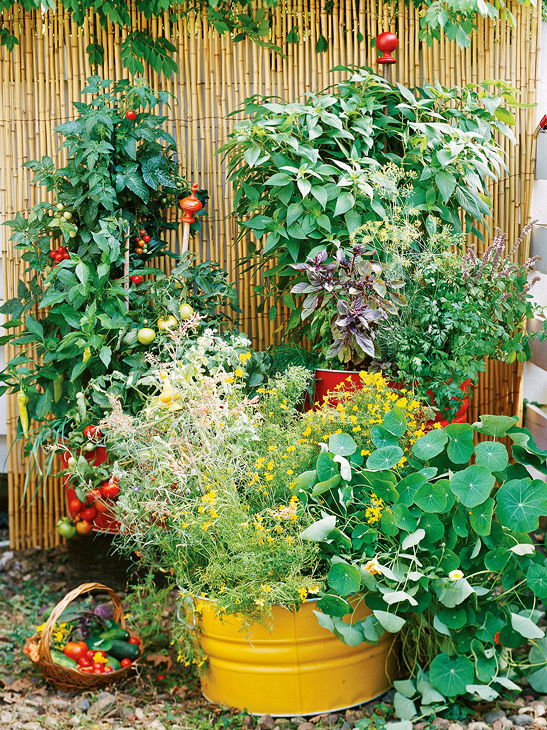 Use supports to grow vines high above the brightly colored containers. These planters contain nasturtiums, signet marigolds, peppers, tomatoes, basil, and pineapple sage. Want to share pics of your edible gardens with us? Tag @potterypatch and #potterypatch on Instagram.